As it’s at ground level, installing an Italian shower requires significant preparation work. So it it a good idea? Well despite the fact that it’s not the easiest model to install, it is certainly more pleasant for everyday life. Here are 10 tips to ensure that this delicate design works. Being very simple, either opened or closed, an Italian shower is always installed at floor level without any difference in height. However, as we will see, there are a few adaptations. There are actually two slopes in a shower, the evacuation slope and the floor slope. The minimum is always 1%,or more but it is better to predict 2-3% to facilitate the evacuation. Ready-to-tile floors are available that offer the necessary slope and can ensure effective tiling If not, it is possible that water will overflow, especially if your Italian shower has no screen. One of the most important objectives is ensuring the waterproofness of your installation. Tiling alone does not guarantee a fully reliable result. There are three alternatives. A Liquid Waterproofing System (LRS) can be applied directly on the walls and floor. The panel to be tiled must be installed in accordance with the sealing strips. Finally, in order to install sealing mats, lay them as paper before tiling to be confident of your results. Slope and sealing must also be performed with precision for the screed which is laid in the shower. It is not always easy to respect the basic rule of a installation at ground level. Particularly in an apartment, the drainage basin is often constructed to be high up. It is therefore almost impossible to align the shower at ground level and to create a sufficient slope. Most often, it will require a rise of a minimum of 15 centimeters. Beware of slipping! Small tiles and non-slip cover are very effective to prevent this. A shower screen or not? Normally there is no shower screen in an Italian shower, but if you plan to install one, remember to perfectly seal the joints. The big question is whether we zhould remove it to leave room for a large Italian shower? In a small bathroom, this it’s necessary to make this decision. It’s also necessary to consider the daily habits of the whole family and especially those of the children. Remember that a bath can consume less water than a shower! Today more and more showers are equipped with mobile and fixed shower heads. Some even have two shower heads, which is a good idea to avoid the morning rush. Before planning the installation of an Italian shower, make sure that is possible to do so in your bathroom and your home without imposing elevation. The real model comes without a shower screen, but it’s best if you have a large bathroom to benefit from this type of design. Installation work should be carried out by experienced handymen, so do not hesitate to call a professional. 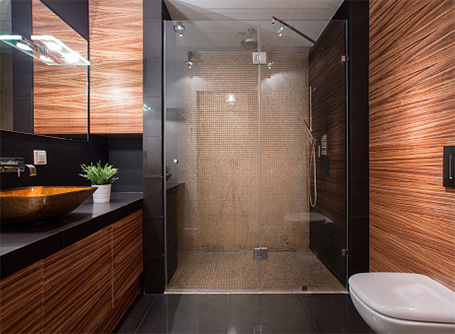 5 tips to design your perfect bathroom!